Case Study - Dignity Meals — em. by Emily. Bringing communities together, one meal at a time. Dignity Meals is a Chicago-based startup looking to design an intuitive, easy-to-use mobile application that matches food donors with volunteers in their local areas to redistribute this normally wasted food to needy families. ← TRY ME! I'm interactive! Problem Four team members set out to eradicate world hunger in 2013, but haven’t been able to figure out how to attract donors and volunteers. Regulation, liability, and accountabilitiy questions remain unanswered. The original idea was to connect local volunteers with needy families by collecting leftovers from local businesses and distributing the leftovers. Now, the team is leaning towards collecting leftovers from establishments and selling these lefteovers to to farms, fertilizer companies, and other agriculture partners who can use it for other uses. Solution Taking the original concept of connecting volunteers to needy families, a few barriers were placed to tackle liability and accountability. The new app is designed as a platform that connects donors (local businesses and establishments) with volunteers and recipient organizations (local volunteer organizations). What do businesses currently do with leftovers? Are there current protocols in place that limits the establishment’s ability to donate any leftovers? Does the business currently donate to local charities and/or organizations? If not, what are some concerns they have? If there was an app that allowed the business to easily schedule pick ups (where a volunteer would come by to pick up the donation), would they consider it? The Who: To find these answers, local business owners were interviewed in-person. Most businesses provided responses were small mom-and-pop shops. Businesses that had multiple locations or were part of corporations were also interviewed. Version One (left) - The initial iteration provides two separate buttons for the user to choose - Sign Up or Sign In. 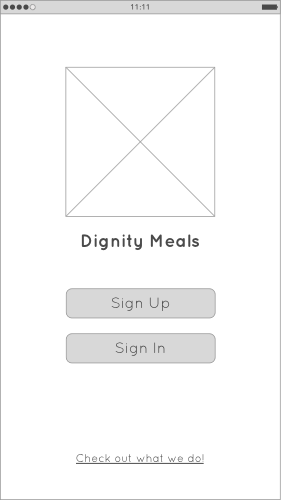 It also showcases Dignity Meals’s logo as the main image. Final Version (Right) - The final iteration provides one button which will bring the user to a page where they can enter their email and password. Existing users will be brought to their home page. New users will be brought to the beginning of the sign up process. Actions pages were condensed into one page followed by a confirmation screen recapping submitted information. This info gets sent to Dignity Meals. Staff members will run a background check on all volunteers, businesses, and organizations who wish to join the Dignity Meals platform. All users will receive a final confirmation email once they’ve passsed their background check. This iteration was designed with the thought of having everything visible in one place. This option did not require a menu as everything was accessible from the home page. This final iteration involves placement of icons. Icons are located at the bottom of the screen to accomodate users who have phones of various sizes. Commonly used icons are placed on the home screen. This iteration was designed to engage the user. 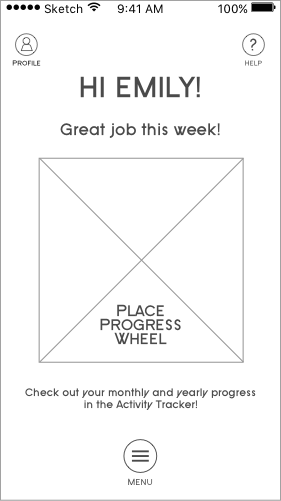 The idea was to provide motivation to continue volunteering by showing their current progress. Commonly used icons are placed on the home screen while secondary functions are nested away in the menu. (Left) Volunteers can view/update their availability by specific days. The original design featured collapsible menus which showcased the current availability for the day when the menu was not opened. To update their availability, the user would select the day they’d like to update and the menu would open. (Right) In this final version, volunteers can view/update their availability by specific days. Collapsible menus were removed and a slider bar was introduced where a user could tap the day they’d like to update or slide over to it. Users can also save changes by day. Version One - The initial iteration of these screens featured collapsible menus and a toggle button that allowed a user to switch between the list and map views. Final Version - Both the list view and map view were combined into one page. A toggle button was added to the Extra Pickups page to allow the user to see where the extra locations fall on their scheduled route.